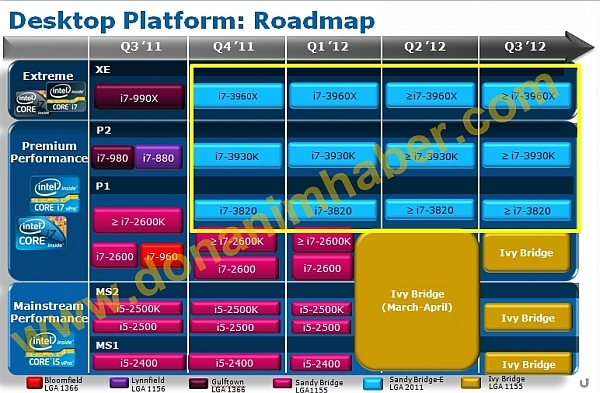 A new Intel Roadmap has been leaked which details upcoming Sandy Bridge-E Processor Details. According to the chart, Intel would release its Sandy Bridge-E Lineup in Q4 2011 (Early October) with 3 Debut processors which will be compatible with the LGA 2011 socket motherboards featuring the X79 (codenamed Patsburg) chipset. The first three processors will include Core i7 3960X (Extreme Edition), Core i7 3930K (Unlocked Multiplier) and Core i7 3820 (Locked Multiplier) CPU’s. These processors have already been detailed here. Core i7 3960X would be the flagship offering of Intel’s Sandy Bridge-E lineup featuring 6 Cores/ 12 Threads, 15MB L3 Cache. Stock clock speed would be maintained at 3.33Ghz which can turbo upto 3.9Ghz. The processor like every other Extreme Edition CPU would cost a beefy ~1000US$ price. Some benchmarks of the CPU were leaked in Intel’s Slide which you can see here. The i7 3930K falls under the performance P2 segment featuring an unlocked multiplier which means it can be overclocked. It features the same 6 Cores/ 12 threads while the L3 Cache is cut down to 12MB and stock clocks are lowered to 3.20Ghz (T.B – 3.80Ghz), The i7 3820 would fall under the Performance P1 segment because of a locked multiplier. Featuring 4 Cores/ 8 Threads Stock speed of 3.60 which can turbo to 3.80Ghz and 10MB L3 Cache. However, i7 3960X wont hold the flagship title forever since it would be replaced by the faster i7 3980X Extreme Edition Processor sometime in 2nd Half of 2012. The new Extreme Edition Processors is rumored to feature 8 Cores which would make it the first consumer Octacore Intel CPU. The clocks would fall under the following frequency – 3.4-3.5Ghz with Turbo upto 4Ghz-4.1Ghz. This CPU has already been detailed here.